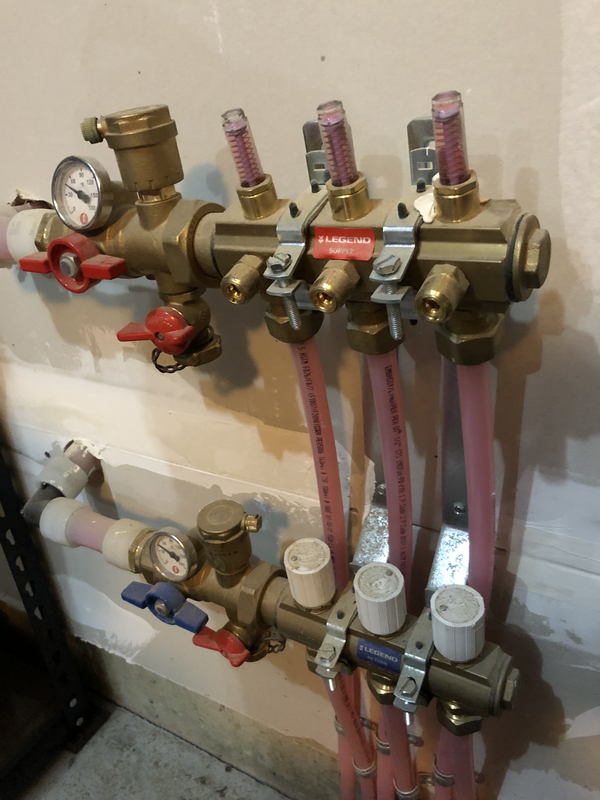 Hoping for a little advice on balancing a manifold. 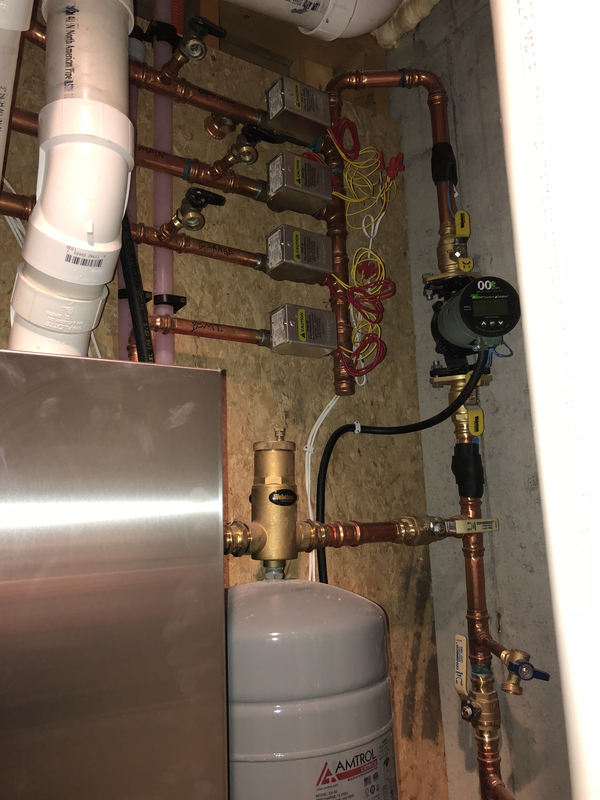 We bought a new house in Minnesota and it has infloor radiant heat throughout, three zones. The master bedroom is quite a bit colder than the rest of the second floor. So I opened up the access panel and this is what I found. The loop all the way on the right just goes from the supply directly to the return manifold and its flow is around 1.3 gpm while the rest of the loops are closer to 0.6. 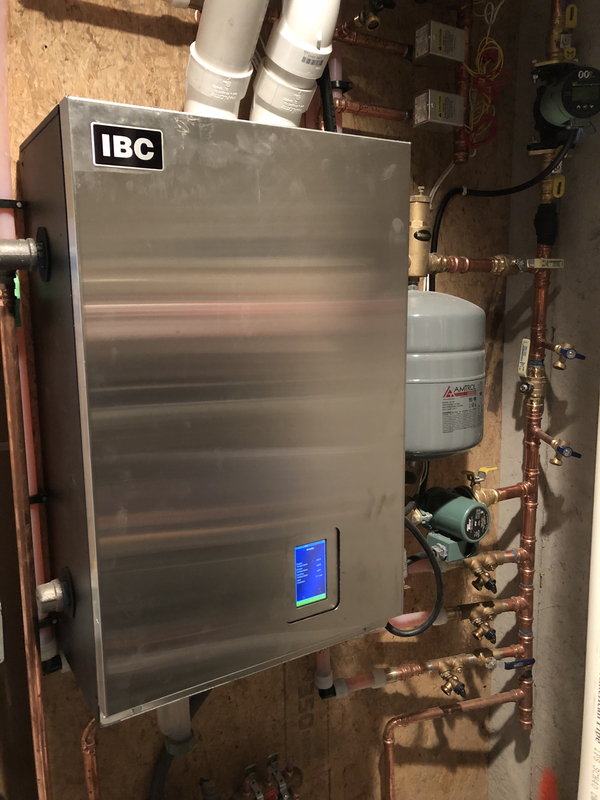 The previous homeowners do not know who installed the system and the builder is no longer in business. Any advice is appreciated. Thanks! Would need to know more about the system to advise. Basically, when you turn the black knob, the flow gauge on the other manifold moves. It sound like they are using the right as a bypass. Depending on the setup, that may or may not be a good idea. Posting pictures on the boiler and piping would help. Can I hitchhike here please? 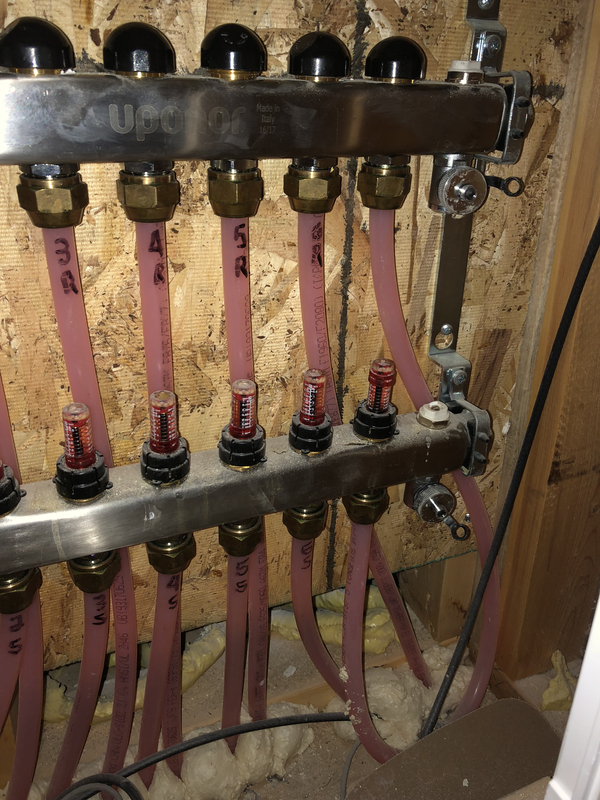 Balancing my new radiant floor, and am feeling the return pipes, am trying to get them to feel equally warm (bedroom loop cooler) once the house is close to set point, is this a reasonable way to balance? Will try to take some more pictures of the other manifolds tomorrow. In the basement and garage there are only three loops each and no bypass. I couldn’t find the 1st floor manifolds. Guessing they’re behind the drywall. GroundUp - you are spot on. The master bathroom and bedroom are basically the south end of the house. The boiler is in the basement on the north end and the manifolds are directly above on the first and second floors. If you’re ever in SW Minneapolis let me know! I’ll try to get pictures tomorrow. Don't really need to see the other manifolds, but the boiler room and piping would be handy. I'm in SW Minneapolis all the time but unfortunately I have a no-compete agreement with my employer so I can't do residential work in the metro. I live 2 hours North of the metro and am based up here. Here are a few more pictures of the whole system, basement and garage zones. I couldn’t find the 1st floor. I balanced the entire second floor including the bypass so that they are all about 0.6 and it made a big difference for the master bedroom and bath. Still colder but improved. Is there any reason to keep the bypass open? I don’t really understand how the temperature drop calculations work. 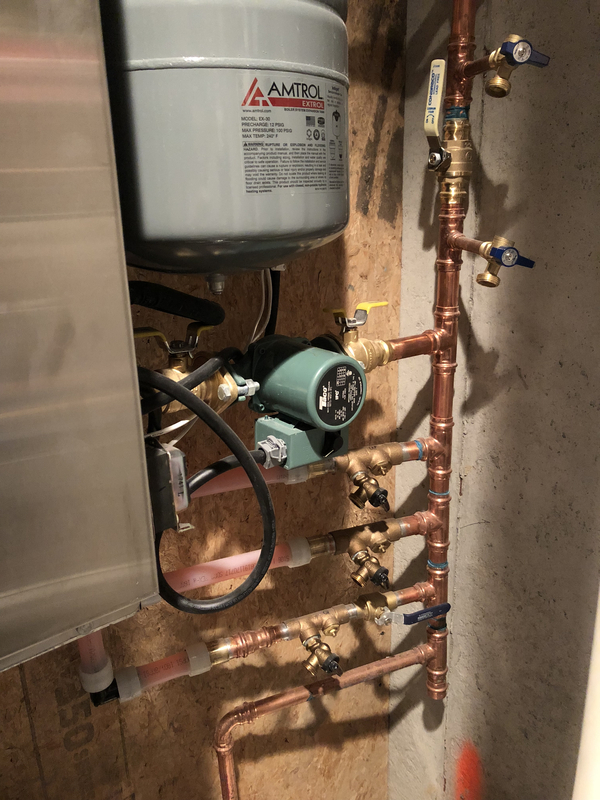 Is the bypass needed for the boiler controller so that the return temp isn’t too low? I have a manifold with a similar extra loop at the end, but was designed with an extra port for future expansion, its meant to be closed. I also use the VT2218 set to 5* dt. works like a charm. make sure that bypass is closed down all the way, & let the system balance for a couple of days & see if it helps your bedroom temps. looks like a primary secondary piping, the valve between the two tees needs to be left full open. It could be the piping supplying all the zone valves is undersized. 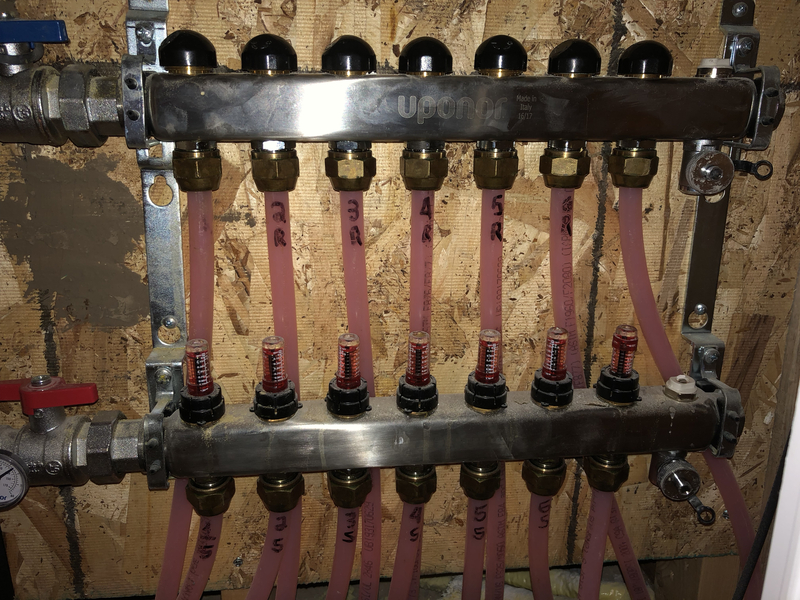 Is it two 1" and two 3/4 zones piped to a 1" header. 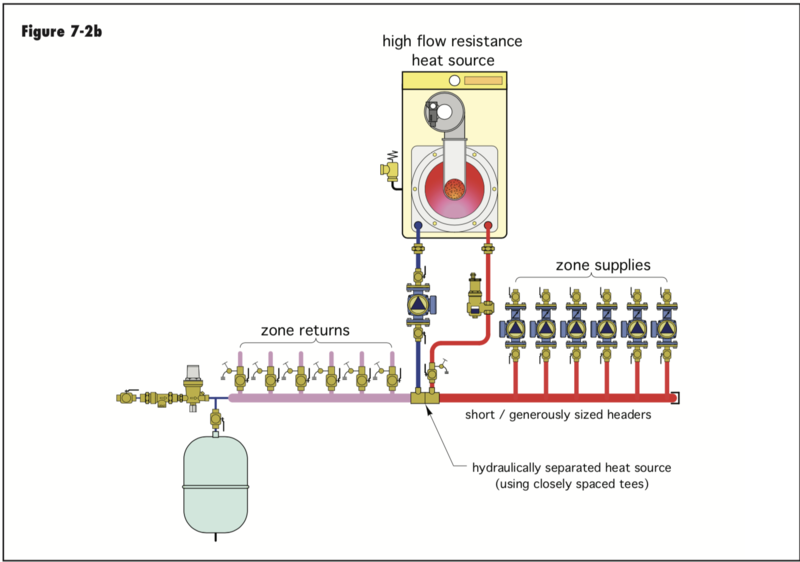 Here is an example, although this schematic shows zone pumps, it could be a single pump with zone valves as you have. 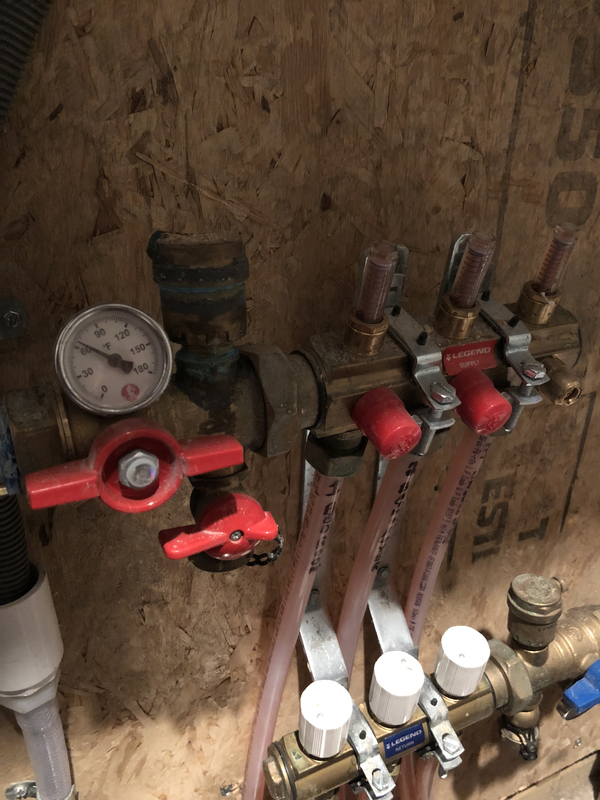 Balancing may get you there, but it could also be a lack of adequate flow with restricted piping, especially when you get to design days. Any idea of the load on the 4 zones? Either BTU/ hr or gpm? looks like your return temp sensor for your vt2218 is placed in the wrong spot. move the lower sensor down to right under the return pipe into the boiler but above the last zone return connection. its there to measure the dt of the house side of the system.